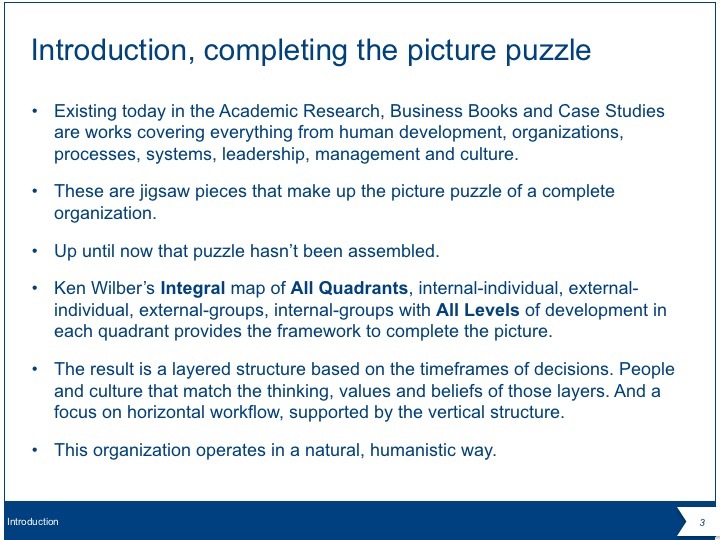 Scattered throughout the academic research on; human development, organizations, processes, systems, leadership, management, culture and found in business books and case studies are jigsaw pieces that make up a picture puzzle of a complete organization. The topics include personal development, our internal thinking and external behaviour, the organizational structures we create and the cultures we live and work in. Up until now that picture has never been completed. 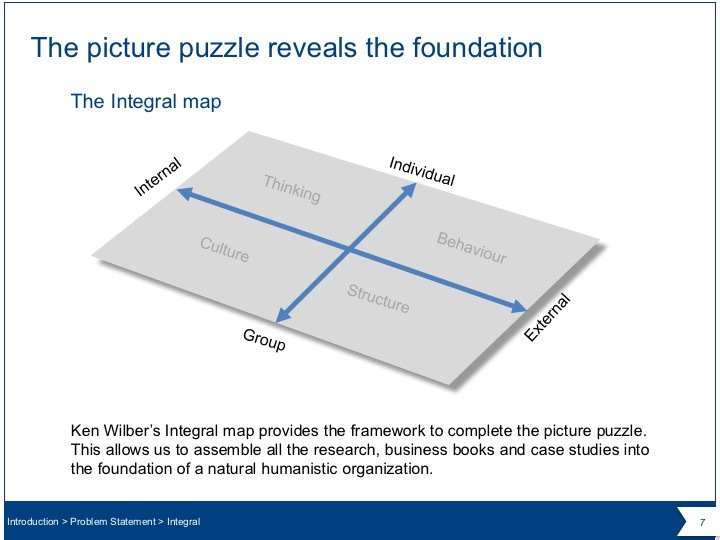 Ken Wilber’s Integral map of All Quadrants, internal individual, external individual, external groups, internal groups and All Levels of development within each quadrant provides the framework to complete the picture. The picture that forms from the research, business books and case studies provides us with the concept of a natural operating organization. 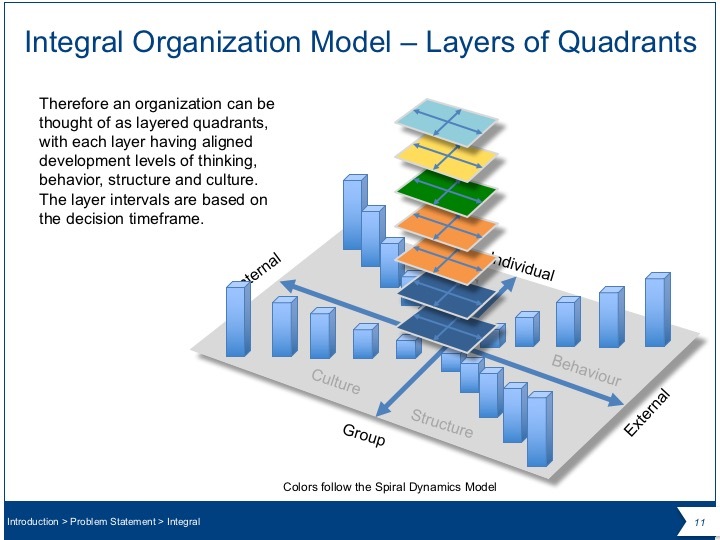 The result is a layered structure with the layers based on their timespan of decisions. 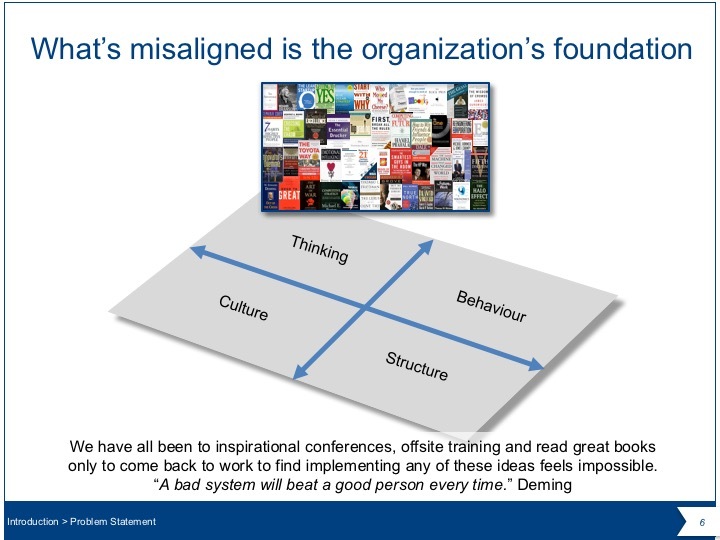 People in the hierarchical roles capable of thinking in those timeframes. A range of cultures that match the values and beliefs of the people operating at each layer. 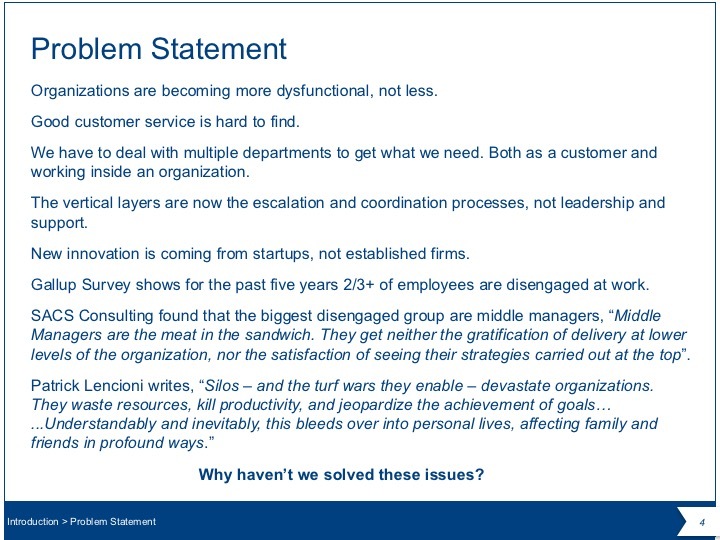 And much more focus than today’s vertical silos on the horizontal flow of work, led from above, but not controlled from above, in self contained teams. 1/ An explanation of the Integral Map, its All Quadrants and All Levels perspectives. 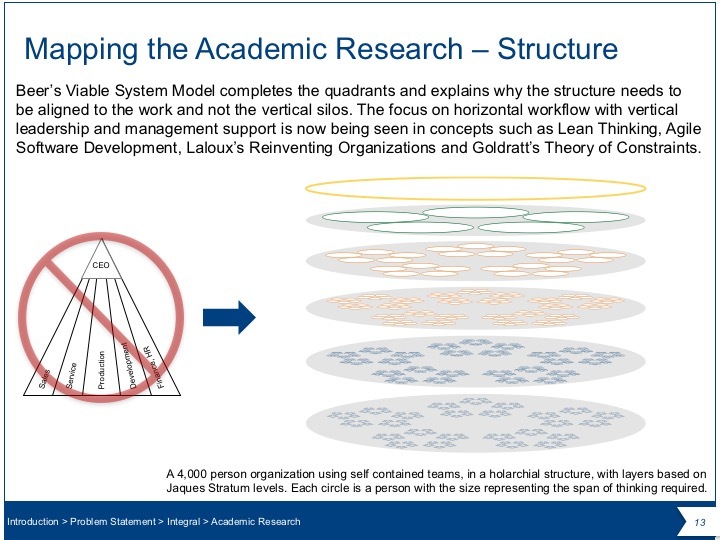 2/ The Why, providing a very small snapshot of the large amount of research of All Levels across All Quadrants. 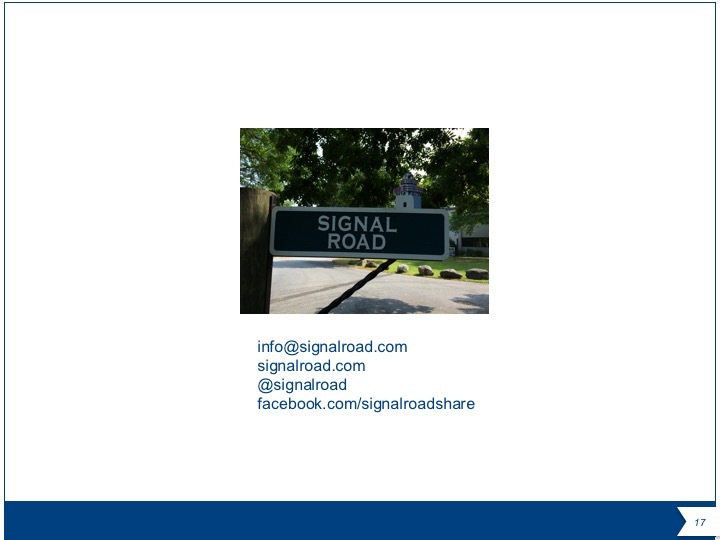 3/ The How to translate the research into steps for implementing the Integral Organizational Model. 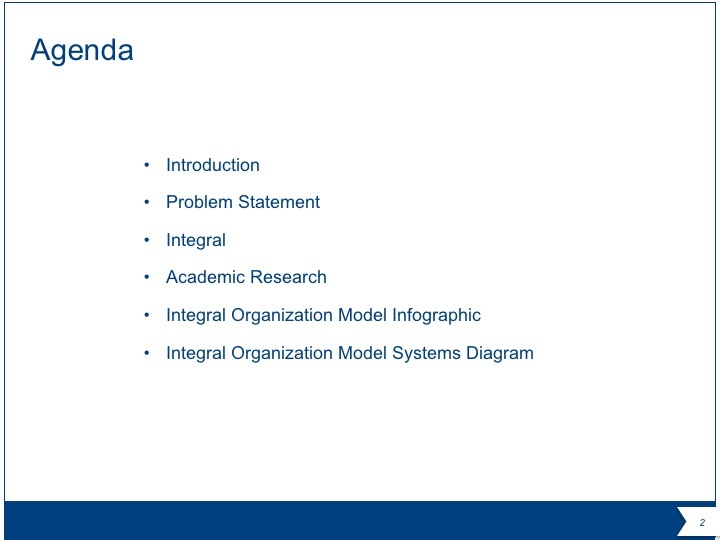 Below is a presentation on how the Integral Organization Model comes together.